John Turmel has achieved a lot in a few specific areas. But it not easy to start talking about a man who is notorious for losing. Losing what you may ask. 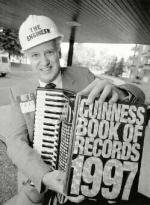 He holds a Guiness Book of Records for the most elections contested and most elections lost. But what has he achieved? He has annoyed a lot of local politicians in Ontario, Canada but what has he accomplished? He has helped the path toward legalization of Marijuana in Canada and some think that is important. But what else? He wrote an article proving that inflation is not cured by higher interest rates as many economists suggest. But most of all I'd say it's spreading the word about the problems with Usury. What most of us call loans that have an interest charge. Some of his most effective moments are his performances at the debates of these local Members of Parliament public meetings. He entertains and wakes people up to a certain reality. At least to those who see how fake and how poorly qualified each candidate often is. When he starts interjecting and ranting he actually is saying some important stuff. He'll say "Abolish interest rates" which is so fundamentally intelligent yet ludicrous that it usually gets a laugh. I could not leave this story without commenting on two areas that he has had significant contributions. One is the legalization of gambling in Ontario and the other is the LETS system for which he is a good spokesman for which I hope to elaborate on more fully in a future article. Let's make UsuryFree Radio the talk of the world as we the usuryfree creatives work to usher in this new age of usuryfree living for everyone on planet earth. Join Us In The Cause For UsuryFree Living!